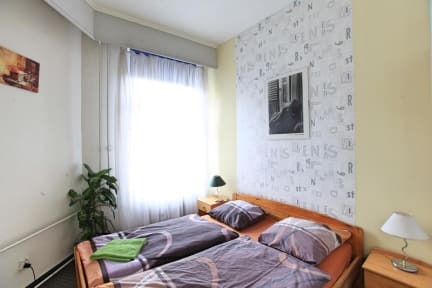 We offer accommodation in apartments and hostel rooms situated in the same building on Seifertova street 53, Prague 3 - Zizkov, close to Prague city centre (Wenceslas Square and Prague Main Train Station), which is 5 minutes walking distance or 2 tram stops. There is the stylish restaurant SKLEP situated in the same building which offers a wide range of carefully chosen dishes. Breakfast for our clients is served in the restaurant. We also offer a 10% discount to residents in our restaurant. Safe, guarded parking is on the opposite side accross the street. We have various sized apartments for 2 to 10 persons. All apartments are newly reconstructed, fully epuipped, with kitchen or kitchenette and private bathroom and wc. There is satellite TV and washing machine in each apartment, electric kettle, coffee maker, toaster and dishes in the kichten. Our hostel offers a cheaper alternative for accommodation. We offer 15 comfortable rooms with shared kitchen and lounge. Newly renovated bathrooms and toilets (separate for men and women, spacious and serviced three time a day) are shared in the hostel. We also have a few room's with private bathroom and toilet. Hostel accommodation is also suitable for groups and school trips. A comprehensive breakfast buffet, satellite TV, Wifi and secured parking are provided for all our guests. We offer free wifi internet access. Towels and bedding are also included. Secured parking and breakfast buffet are available for a small extra fee. Gute Lage mit vielen Kneipen, Restaurants und einem Supermarkt unweit. Die turistischen Hotspots sind fussläufig innerhalbvon 30 min. zu erreichen, oder aber man kann die Bahn nehmen, was noch schneller geht. Obwohl ich die Stadt nicht kenne, denke ich, dass man kaum zentraler wohnen kann, wenn man am turistischen und am "echten" Prag interessiert ist. Das Zimmer stand im guten Preisleistungs Verhältnis und das Personal War hilfreich und nett. Hygienisch gab es nichts zu beanstanden. Wir hatten ein Doppelzzimmer mit eigenem Bad. 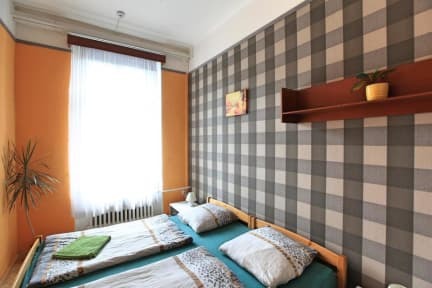 Das Zimmer war sehr groß und hübsch eingerichtet. Das Personal war bis auf einen Mitarbeiter sehr freundlich. Das Hotel liegt sehr zentral. Zu Fuß und mit Gepäck ist der Weg allerdings recht anstrengend, da es ein ganzes Stück bergauf geht. Sehr tolles Hostel! Ist wirklich nur zu empfehlen. It's good value for momey. Not modern/stylish but everything you need, and clean. It was an okay stay. The hostel doesn't convey the most welcoming atmosphere, but all the necessary things are in place. We didn't spend much time at the hostel so it was completely fine for our purposes. The staff seemed to be pretty busy usually and there is no real reception which wasn't very practical. The breakfast was alright even though there were not many different things to choose from, especially if you're vegetarian. The location of the hostel however was excellent.